Rubber Clark: Don't feel bad guys....the new supergirl is all plastic too. I work in a comic store and the only Smallvill efigure we still haven't sold is Lana. Not an entry. Just funny. Designer: As you can tell by their colors, the figures represent the four natural elements, and Cyborg represents metal, or (does air quotes) "industrialization". When all of these elements are in harmony and balance, the team thrives. When those elements are out of balance, the whole team suffers. So these action figures are fun superheroes, but they'll also teach children about Mother Earth and her delicate balance. Boss: You've been smoking ^$& with Al Gore again, haven't you? 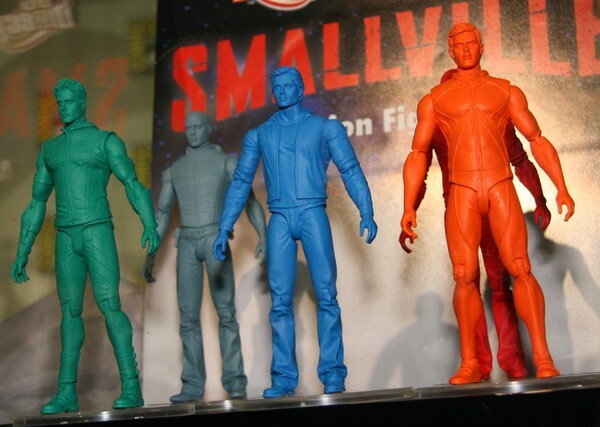 From Jell-O, Smallville Lifemolds! For all the young women who wanted to pause and lick their favorite Smallville star! This earns my award for "creepiest caption ever". Elderly Han Solo: "Yeah, well in MY day, Carbonite only came in one color... you kids today have it too easy..."
Clark: Hey guys, am I the only one getting the feeling that someone's playing with us? Martian Manhunter: *clutches Ollie's throat* WHY ARE YOU GREEN?!?!?! Clark: Why are you looking at me like that? Clark: You very much need to die. Further down the toy aisle, Barbie was checking out Oliver Queen. Dancing Neal Bailey figure sold separately.